Sometimes, it’s difficult to toot your own horn. You know that throughout your career you have done great things and compiled a variety of impressive accomplishments. However, you really don’t want to come off as a braggart or boaster. So, you simply choose to stay quiet – and keep it all in. The unfortunate end-result of such humbleness? Your great work may go unnoticed. One way to overcome this problem, however, is to simply let your work speak for itself. Enter the professional portfolio. 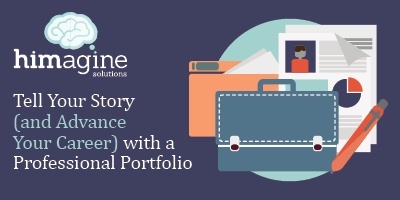 As a health information management (HIM) or cancer registry professional, you may not have considered the value of a professional portfolio. But like an artist’s book of paintings or a writer’s collection of published works, a professional portfolio is a way to display your work, making it possible to tell your career story and highlight your accomplishments. With a professional portfolio, you can confidently showcase your accomplishments and abilities during annual performance reviews, job interviews, internship interviews, leadership meetings – or simply when you are discussing the trajectory of your career with peers, friends and family. Putting a compelling professional portfolio together, however, requires some planning (and of course, good, old-fashioned hard work!). Here are six steps to putting a powerful professional portfolio together. Think of everything that you have accomplished during the course of your education or career and start gathering the evidence of a job well done. Academic and professional documents. Include copies of your degrees, professional certifications and membership in industry associations. If you are a student or relatively new to the workforce, it’s important to include information about specific courses or academic projects too. Recommendations. Letters of recommendation from past employers or academic instructors are great, but don’t limit this section to formal recommendations. Feel free to include casual e-mails or notes that mention a job well. If you are planning to use the portfolio as part of a job search, try to secure reference letters in preparation for your interviews and include them as well. Awards. Include all academic and professional recognitions. If you were a member of your school’s honor roll, go ahead and include your report card, showing the grades that you achieved. If you were employee of the month, include a copy of the certificate. Work samples. What can you use to serve as an example of a real-world innovation or accomplishment? My own portfolio includes a one-page document that I created and have used successfully to educate doctors on how to correctly document in the medical record. Providing samples of these types of documents demonstrates my knowledge and expertise in my field. Volunteer work. Highlight all your volunteer work – both in the HIM and cancer registry profession and in the community. If you received a letter of recognition for the work that you did on your neighborhood beautification committee include it. It’s important to show that you are a well-rounded individual who is not afraid to roll up your sleeves for the greater good. Résumé or curriculum vitae (CV). Make sure that your portfolio contains an updated version of your résumé or CV. Develop a personal message that will help to summarize this information and lead the reader through the documents. In this message, you can highlight the accomplishments that you are most proud of – and talk about what you are looking to achieve in the next few years. Indeed, this opening document helps the reader see you both as a professional and as a person. It’s important to decide if you want to present a “comprehensive” view of your career of an “abridged” version. For example, if your career has included work as both an HIM professional and a cancer registrar, if are preparing for an interview for a cancer registry position, you probably only need to include or emphasize the relevant elements of your registry portfolio. Be prepared to customize the contents of your portfolio to best fit the situation in which you’ll be presenting it. These documents will help the reader understand the purpose of the portfolio – and enable them to quickly access the documents they are most interested in reviewing. Think about the image that you want to present and look for a presentation form that suits you. You can use a high-end leather portfolio case, a three-ring binder or a colorful folder. Use high-quality paper throughout, consider using sheet protectors to preserve the pages, and use labeled dividers to facilitate easy navigation. You can also create an electronic version of your portfolio in a portable document format (PDF). You might also want to consider organizing your documents and presenting them in an online professional portfolio program. After completing these steps, it’s time to do what’s most important: Use your professional portfolio. Go ahead. Don’t be shy. You now have a tool that can tell your story in a powerful way and help take your career to new heights. Gina McNellis, MA, RHIA, CTR, CHP, is himagine’s Director of Registry Services, with responsibility for overseeing our cancer, trauma, and other registry programs. Gina has over 26 years of experience in health information management (HIM) and cancer registry and has been an educator for both HIM and CTR programs. Join her at NCRA’s 44th Annual Educational Conference where she’ll share more tips and tricks during her education session, Professional Portfolio for the Registry Profession, on Wednesday, May 23, 2018.